HKLA was very pleased to attend the HKU SPACE Honorary Fellowship ceremony on 21st November 2017, during which Dr Kan Lai-bing was recognised for her important contributions to HKU SPACE. Dr Kan is also an HKLA Honorary Fellow. Dr Kan was first elected Chairperson of the Hong Kong Library Association 1961, and was elected again several times over the decades. She has made innumerable and historic contributions to HKLA and the Library profession in Hong Kong. 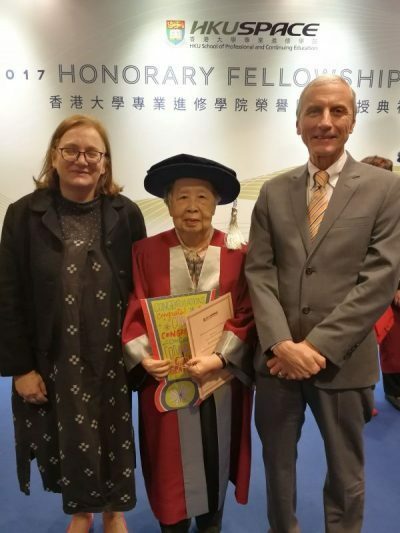 HKLA President, Ms Louise Jones, and Vice President, Mr Peter Sidorko, were glad to attend the ceremony and congratulate Dr Kan on her well-deserved HKU SPACE Honorary Fellowship.